Do you want to learn about Immune Disorders? 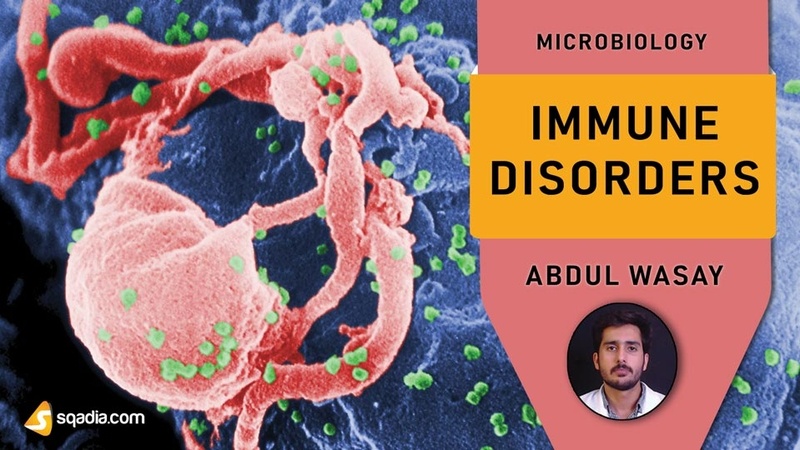 If yes, than you are now at right place as Abdul Wasay at sqadia.com is here to provide you complete in depth understanding of Immune Disorders. Abdul Wasay begins with explanation of acquired immune tolerance. Then negative selection and central tolerance is pursued. At the end, Peripheral Tolerance and Anergy is discussed. Educator tells that the mechanisms happening all over the body is known as peripheral tolerance and these supplement central tolerance. In the very first slide information about hypersensitivity is given. Next is the elucidation of hypersensitivity I. Then anaphylaxis is discussed. Likewise, hypersensitivity II comes under consideration. Type II hypersensitivity is generally called a cytolytic or cytotoxic reaction. Initially, educator elaborates blood typing and hypersensitivity. After that hypersensitivity III is discussed. Following this, hypersensitivity IV is highlighted at the end of this section. Additionally, educator reveals that a major factor in the type IV reaction is the time required for T cells to migrate to and accumulate near the antigens. In the beginning, educator introduces autoimmune diseases. Autoimmune disease results from the activation of self-reactive T and B cells. In the next slide, light is shed on the concept that autoantibodies cause autoimmunity. At last, human autoimmune diseases are focused. Earlier in this section, tissue rejection is pursued. After that potential transplantation reactions are elaborated. Following this, graft versus host disease is discussed. Educator tells that organ transplant recipients also can develop graft-versus host disease. In the end, immunodeficiency is highlighted.